Another photo of Drymaeus elongatus (Röding, 1798) from Curacao. Thanks to the group of explorers that almost weekly visit a part of the island, regularly a snail (usually in dormancy like this one) turns up in the photo reports. This picture was made by Fred Chumaceiro during a visit to Rooi Katoen. This entry was posted in Uncategorized and tagged drymaeus, West Indies on April 9, 2019 by bramb. Another paper just published in the ‘end-of-the-year-stream’ is by Harasewych & Tenorio. Their abstract reads: “Morphometric analyses of shell shape of living specimens of Cerion inhabiting San Salvador Island segregate samples into two primary phenotypes, one inhabiting the western and southern coasts of the island, the other the eastern and much of the northern coast. These are concordant with phenotypes identified in prior morphometric studies. Lectotypes are designated for Cerion watlingense Dall, 1905; C. inconspicuum Dall, 1905; C. inconspicuum lacunorum Dall, 1905; and C. coloni Bartsch, 1924. The lectotype of Cerion watlingense Dall, 1905 falls within the western and southern phenotype, and is the oldest name available for this taxon. The lectotype of Cerion coloni Bartsch, 1924, a validly introduced, but previously unrecognized taxon, and the holotype of Cerion rodrigoi Gould, 1997 both fall within the group containing the east coast populations, with Cerion coloni Bartsch, 1924 being the oldest available name for this phenotype. A third, previously unrecognized phenotype, represented by a single inland population, is morphologically similar to the lectotype of Cerion inconspicuum Dall, 1905, which is the oldest available name for this phenotype. The geographical distribution and chronological succession of these phenotypes since the late Pleistocene is reviewed in the context of both the single and multiple colonization models for the arrival of Cerion on San Salvador, and the evolutionary and taxonomic corollaries of each model are discussed”. An interesting paper which shows that morphometric analysis may be needed when the morphology and distribution are seemingly entwined. The study of Cerion, which has intrigued many authors, has been elucidated with a thorough discussion of both the morphological and distributional aspects of the species of this island. Harasewych, M.G. & Tenorio, M.J., 2018. The genus Cerion (Gastropoda: Pulmonata: Cerionidae) on San Salvador [Watling Island], Bahamas: a geometric morphometric analysis of shell morphology. – The Nautilus, 132 (3-4): 71-82. This entry was posted in Uncategorized and tagged cerionidae, literature, West Indies on December 27, 2018 by bramb. Lenoble et al. just published a new paper on Amphibulima patula (Bruguière, 1789); see for another paper on the same species here). The English abstract in the paper of Lenoble et al. reads “The finding of a live specimen and several fresh shells of Amphibulima patula (Bruguière, 1789) in Marie-Galante closes a one hundred-forty years long period during which the species was not observed on the island. The comparison of environmental conditions between the new locality and the historical locality where the snail is no more observed today suggests the main factor determining the occurrence of the species being a shrubby undergrowth of plants with limited seasonal variations. In Marie-Galante, such conditions can be found in shady high forest of ravine bottoms with deep soil. The extent and the fragmentation of species distribution area on the island are still to be established”. These semi-slugs have been reported from similar habitats in other islands (Dominica, St. Kitts and Nevis, Saba). These are vulnerable habitats, and probably so the occurrence of this species on these islands is equally vulnerable for habitat destruction and climate change. Lenoble, A. et al., 2018. Redécouverte d’Amphibulima patula (Bruguière, 1789) à Marie-Galante Petites Antilles (Gastropoda, Amphibulimidae). – Folia conchyliologica 46: 31-35. This entry was posted in Uncategorized and tagged Amphibulima, literature, West Indies on November 1, 2018 by bramb. Arnaud Lenoble (Univ. Bordeaux) was so kind to supply me with a series of photos of Amphibulima patula (Bruguière, 1789) shells collected this summer at Marie-Galante, close to the historical locality of Mazé. One of the specimens was found alive. This entry was posted in Uncategorized and tagged Amphibulima, West Indies on September 19, 2018 by bramb. In a paper recently published, Lenoble et al. report on fossil specimens of Amphibulima patula found on Guadeloupe and neighbouring islands. “Amphibulima patula (Bruguière, 1789) is a rare native terrestrial mollusc from Guadeloupe. 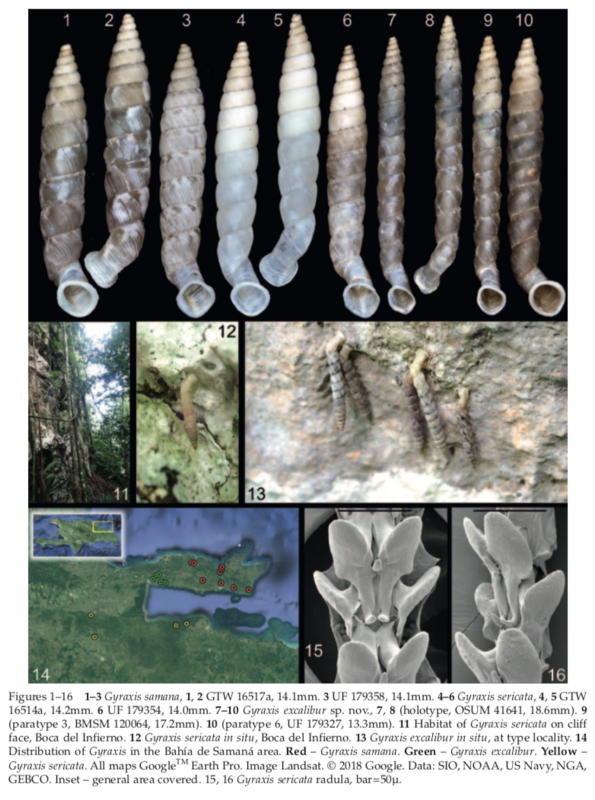 The past distribution of this species, assessed by shells collected from archaeological sites, natural deposits or surface surveys, shows it previously had a wider distribution that extended across all the limestone islands of the Guadeloupe archipelago. Stratigraphical contexts and radiocarbon data suggest that the presence or abundance of A. patula is related to periods of wetter environmental or climatic conditions, indicating that environmental factors influenced past variations in the distribution of this species. Its limitation to rare ecological refuges in periods of dry climatic conditions, combined with human-induced landscape modifications, have led to significant reductions in the numbers of individuals of this species that is today threatened with extinction in the Guadeloupe Islands”. This is an interesting paper as it gives for the first time detailed radiocarbon data on this species, revealing the age of the fossils. The shells shown reveal an interesting variation. The paper contains also interesting information on ecological conditions and suggesting evidence for its former wider distribution. Lenoble, A. et al., 2018. Quartenary occurrence of the rare land snail Amphibulima patula (Bruguière, 1789) in Guadeloupe (Mollusca: Amphibulimidae): ecological and palaeoenvironmental implications. – Quartenaire, 29 (2): 121-130. This entry was posted in Uncategorized and tagged Amphibulima, fossil, literature, West Indies on September 18, 2018 by bramb. This photo was part of a series made at Curacao by the ‘speurneuzen’ group, who weekly explore a different part of the island. These snails (Drymaeus elongatus) were pictured in the Christoffelpark at wayaka trees. Photo courtesy by Fred Chumaceiro. This entry was posted in Uncategorized and tagged drymaeus, West Indies on September 13, 2018 by bramb. Just released: a paper by Thomas Watters dealing with the urocoptid genus Gyraxis, and describing a new species. The abstract reads “The genus Gyraxis in Hispaniola is reviewed, currently only known from the area of the Bahía de Samaná in the Dominican Republic. It includes three taxa: Gyraxis samana (Clench, 1966), G. sericata (Pilsbry, 1903) and G. excalibur new species. The radular morphology and isolation from Cuban Gyraxis suggest they may yet require a new genus”. Watters also, when dealing with the nomen inquirendum Cylindrella gouldiana Pfeiffer, 1853, indicated this taxon has never been figured and that Crosse subsequently mentioned the first precise locality for the species (“Région Dominicaine: rochers du Tablaso, près San Cristobal (A. Sallé)”). Watters expressed “it is not clear how he knew this”. This answer is simple: Crosse always indicated behind his localities the collector of the material, in this case Sallé. The material which Crosse saw may either have been returned to Sallé or have ended up in the Crosse collection. Both collections have been dispersed after their owner’s death, and the current depository of the material is unknown. Watters, G.T., 2018. The genus Gyraxis Pilsbry, 1903 (Gastropoda: Urocoptidae) from Bahía de Samaná area of the Dominican Republic. – Journal of Conchology, 43: 103-108. This entry was posted in Uncategorized and tagged literature, taxonomy, types, urocoptidae, West Indies on May 4, 2018 by bramb.